Fertilizer numbers, what do they mean? Photo of a fertilizer analysis for Starter Fertilizer. When I think of fertilizer numbers, I think about the good ole days when buying a bag of fertilizer was pretty simple. There were very few choices and the prices were reasonable. Now days, there are dozens of choices available from our local retailers. Prices are higher than ever due to the fact that everything we buy is related to the price of oil, including the fertilizers we buy for our lawn. During my career as a garden center employee, I’d often have an “old-timer” come in and ask for “Triple 13”. Now I’m not talking about some fancy casino slot machine game! “Triple 13” or 13-13-13 refers to the nutrient analysis in that particular bag of fertilizer. The three numbers represent Nitrogen (N), Phosphorus (P) and Potassium (K). These are the 3 macro-nutrients that make up a bag of fertilizer sold for the purpose of feeding your lawn. 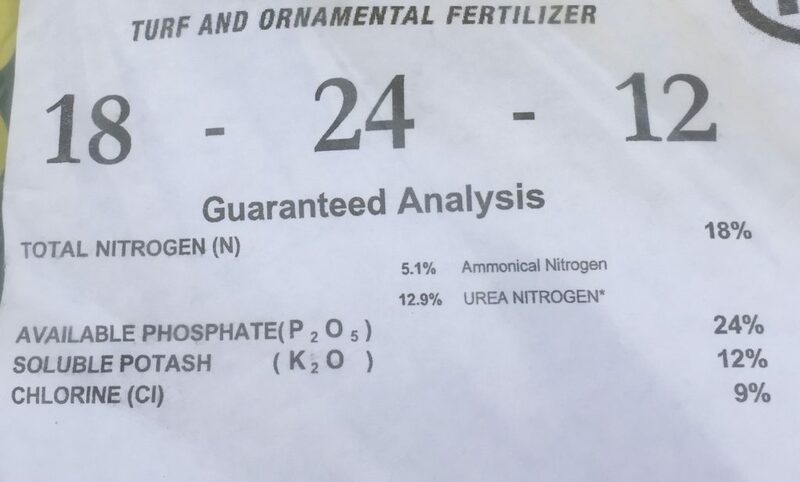 The first of the fertilizer numbers is Nitrogen (N). Nitrogen is the key ingredient for feeding your lawn. It is what promotes the growth of everything you see above ground. Frequent Nitrogen feedings will maintain healthy, consistent growth in a high quality lawn. Generally, the bags of fertilizer that you buy will have more nitrogen in them than any other nutrient. Nitrogen also is the quickest to get used up by the grass. The next of the fertilizer numbers is Phosphorus (P). Phosphorus is the second ingredient that makes up the fertilizer analysis. Phosphorus is the nutrient that most directly affects the development of the roots of the plant. If you look at the analysis of many “Starter Fertilizers” or “Root Stimulator Fertilizers” you’ll see that they contain a larger percentage of Phosphorus that most other fertilizers. In recent years, the amount of Phosphorus in fertilizers have been lower or eliminated due to high costs. The last of the fertilizer numbers is Potassium (K). Potassium is the third main ingredient used to make up the fertilizer analysis. Potassium is the key to improving the hardiness of the plant. What that means is that Potassium helps improve the heat and cold tolerance. It also helps improve the disease and drought resistance of the grass as well. Now there are secondary macro-nutrients and even more micro-nutrients that used in a bag of fertilizer and you can read about them my blog post What nutrients does my lawn need? Triple 13 is still being sold today in hardware stores and garden centers. Fertilizer numbers can be overwhelming to understand. Like anything else, make sure you read the label to understand what it is you are buying. For more information on how to choose a bag of fertilizer read the blog post Top 5 things to remember when choosing a bag of fertilizer for your lawn and you will be better equipped to make the best purchase. Time to fertilize? 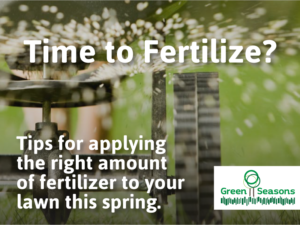 2 tips to make sure you don’t put on too much fertilizer this spring.